If you’re a municipal official, developer, real estate professional, or property owner who is looking for guidance on how to maximize the value of commercial areas, check out the Chester County Planning Commission’s award-winning Commercial Landscapes planning series. The series includes four reports that discuss how current trends are affecting office parks, retail, brownfield, and train station areas throughout the county and provides recommendations for the continued health of our commercial landscapes. The reports focus on brownfields, transit oriented development, greyfields, and office parks and are available on the Chester County’s Planning Commission website. 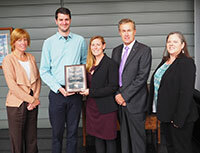 Members of the Planning Commission’s staff recently won a statewide award for the Commercial Landscapes series at the Pennsylvania Chapter of the American Planning Association’s annual conference, which was held from Oct. 22-Oct. 24 in State College, Centre County. The Planning Excellence Award – Best Practice honored the work of Community Planner Jaime Jilozian, former Urban Planner Justin Smiley, and former Community Planner Sean O’Neill. Jaime said she was grateful for the team effort that went into this project. “I would like to acknowledge how valuable the contributions from the Commercial Landscapes Task Force and the other Planning Commission staff who worked on this project were to the success of the series,” she said. The task force was comprised of about 35 people, which included representatives from municipalities and agencies along with developers and consultants. The series was debuted at an event at Penn State University’s Great Valley campus in June. The event featured experts who shared ways for municipalities, developers, and consultants to better position themselves for economic development success. “It is important to maximize the value of commercial areas in the county through realistic strategies that promote the best practices and respond to the changing market conditions,” Jaime said.